Teacher Tom: "I Want It Out!" 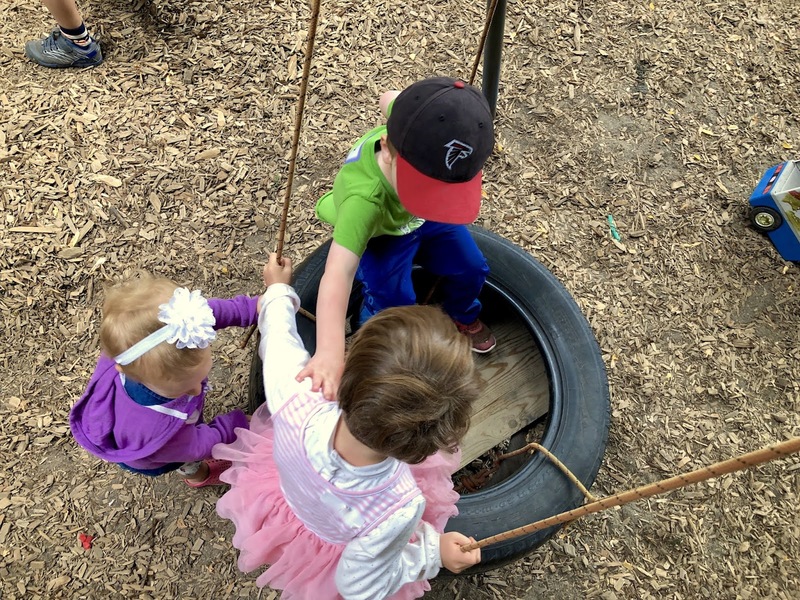 When we replaced the pallet swing with a tire swing, some of the kids were ticked off. They had loved their pallet swing, but some of the adults were concerned about the hard, sharp, spinning and swinging corners of the shipping pallet and felt that replacing it with a tire would reduce the "hazard" without likewise reducing the "risk," or as the kids phrased it, the "fun." "It's no fun!" more than one of them complained, even before trying out the new swing. Part of the objection was obviously a reaction to change, but when I dug down with a couple of the more vocal children, we determined that the main thing that was missing was a floor. The pallet had provided a nice flat platform upon which several children could sit together while swinging, whereas the tire, with it's hole in the middle forced everyone to sit on the edges which wasn't as much "fun." So we made a floor by cutting several pieces of wood that fit snuggly inside the tire, side-by-side. 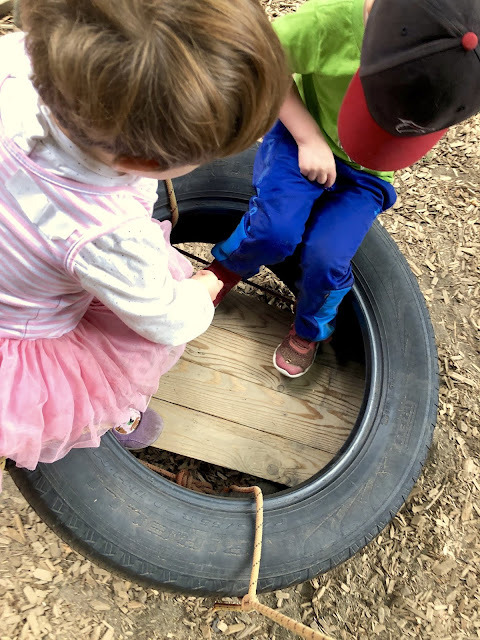 The individual pieces of wood are loose within the tire, creating the impression that they are removable, but they aren't, at least by preschoolers who don't have the physical strength to bend the edges of the tire the way we adults did while installing them. This doesn't mean that kids don't try to remove them. Every now and then someone gets a bee in her bonnet about it, making it a project, one that involves the struggle of a puzzler noodling over a frustratingly impossible challenge. Yesterday, a three-year-old girl took it on, while a three-year-old boy objected. They were wrestling over the boards, pushing and pulling and wresting. Their faces were intense with the effort. Every now and then, one of them would say, "I want it out!" to which the other would reply, "I want it in!" It was a classic conflict between two strong-willed children. Typically, I don't involve myself until and unless the children show me, by resorting to violence, that they need some support. There was some pushing of the shoulder-to-shoulder variety, but I didn't interpret it as violent as much as "persuasive" in nature, especially since they continued to speak with one another, fussily, firmly, even a bit angrily, but still under emotional control, both clearly accustomed and expecting to get their way. The intensity was ramping up, however, so I moved closer. They were contending over those boards, one pushing downward, while the other pulled upward. They were getting louder. A younger child approached the two, oblivious to their conflict, taking hold of the ropes that suspend the tire. She had earlier discovered pleasure in pushing the swing and was seeking to recreate it. Ignoring the bigger kids wrestling around, she began to gently rock the swing. They continued to contend with one another, but as the swing began to move, they both raised their legs, still saying, "I want it out!" and "I want it in!" albeit with the intensity turned down a notch as they concentrated on taking seats side-by-side on the tire. With the tire now freely swinging, the older kids fully on board, the younger girl was able to create a steady rocking motion: back-and-forth, back-and-forth. The older kids were no longer wrestling, their hands taking old of the ropes, their bodies balanced for the ride. There were a couple more murmured rounds of "I want it out/I want it in," a kind of wind-down as their conflict fizzled out. Soon they were giggling together, sharing the swing, no longer thinking about the floor upon which their feet rested as they swung together back-and-forth, back-and-forth. 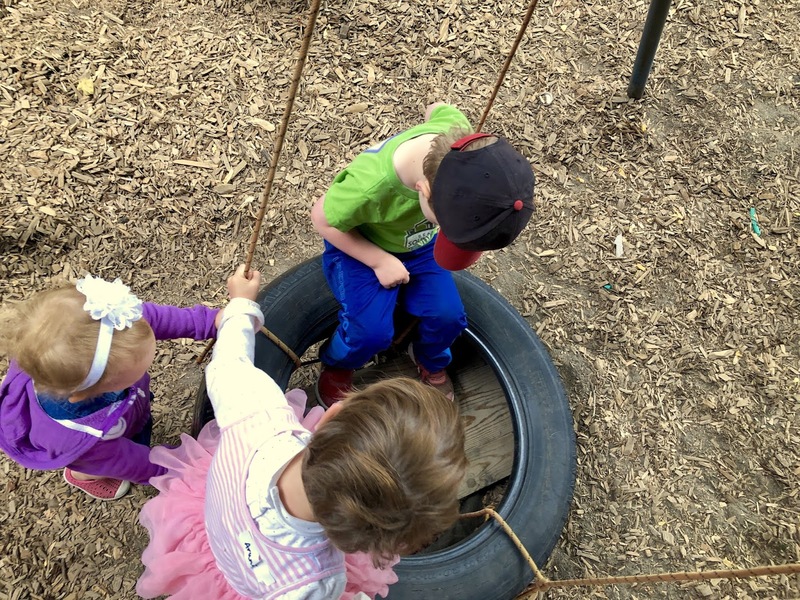 When the younger girl lost interest in her game, the older children took turns pushing one another.